World Book Day is celebrated on 23 April and serves as a reminder of the importance of literacy for children around the world. According to UNESCO, an estimated 122 million youth globally are illiterate, and 67.4 million children do not attend school, inevitably leading to illiteracy and further problems later on in life. Through our many Care and Teaching projects, Projects Abroad promotes literacy rich environments to hundreds of children who do not have access to formal schooling. With the aid of comprehensive management plans and other tools, we are committed to monitoring and improving literacy rates in the schools, care centres and communities in which we work, as well as improving access to education through resources, volunteers and safe learning environments. Through such efforts, we have achieved an increase of over 5.8% in access to literacy materials in 34 schools across 11 countries, in the last year alone. 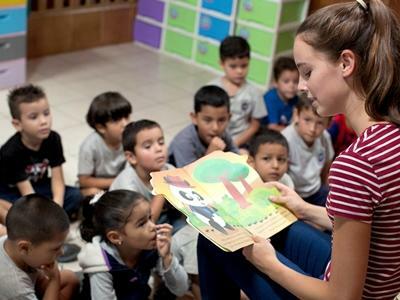 To mark World Book Day this year, Projects Abroad will be holding events in nine destinations to highlight the importance of reading and writing for children. From mobile libraries to reading sessions and one-on-one tuition, our dedicated staff and volunteers in these countries will work to inspire children with the written word and to encourage a passion for learning. There will be a storytelling session at the National Children’s Library in Ulaanbaatar. Volunteers will read for children from our various placements and we will also do a short story/comic book competition for the older children. We will continue our ongoing work in running reading clubs across 15 kindergartens. We donate these books and the volunteers run el círculo del cuento, or ‘Story Circle’, with the children every day. Staff and volunteers will be building a library for one of our village-based schools. We will construct the book shelves and buy new books to go with it. Reading and writing English is very important in Fiji, as it is the common language between the diverse ethnic groups in the country (primarily i-Taukei and Indo-Fijian). Our mobile library will travel to disadvantaged communities north of Phnom Penh. We will have storytelling in English and will also donate basic literacy materials. Many people in these communities earn less than $3 a day, so large numbers of children do not have access to formal education. We will take our mobile library to an isolated village primary school, bringing books in French and Ewe to the children. Some of these books will be on loan but we will also donate basic materials. Additionally, we will continue with our weekly reading club at a local orphanage. Staff and volunteers will repair bookshelves to create a mini library at one of our placements, Wonderful Love. Projects Abroad built this school in the Akuapem Hills and funds it as the only educational facility in the community. Over 160 children attend this school. We have a long-standing Literacy Programme in Cape Town, providing one-on-one tuition to children who struggle with reading and writing. Volunteers and staff will lead three groups from this project in a story writing workshop; children will read their stories to their peers and a prize will be awarded for the best story. Healthy snacks will be provided. From our Bring a Book Campaign we have built a library in our IT training centre in Panadura. We will run a Story Time session, where volunteers will create a story book and perform the story for children from the local Montesorri Preschool. Volunteers will take part in a book donation at a local school near Arusha. The school has an under-supplied library which we hope to fill with books and writing materials. We wish all staff and volunteers the best of luck and we look forward to sharing many stories and photos from our World Book Day celebrations around the globe. 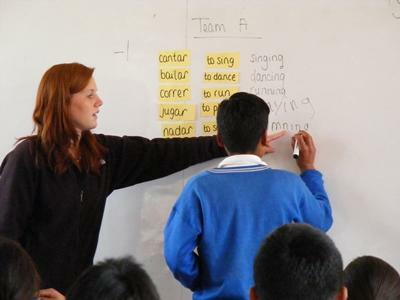 If you’re interested in contributing to sustainable literacy programmes for underprivileged children, find out how you can get involved in our Care and Teaching projects in 30 destinations.